This article is about the book in the Christian New Testament. For the literature genre, see Acts of the Apostles (genre). For the acronym, see ACTS (disambiguation). "Acts" redirects here. For uses of Act, see Act. Acts of the Apostles (Ancient Greek: Πράξεις τῶν Ἀποστόλων, Práxeis tôn Apostólōn; Latin: Actūs Apostolōrum), often referred to simply as Acts, or formally the Book of Acts, is the fifth book of the New Testament; it tells of the founding of the Christian church and the spread of its message to the Roman Empire. Acts and the Gospel of Luke make up a two-part work, Luke–Acts, by the same anonymous author, usually dated to around 80–90 AD. The first part, the Gospel of Luke, tells how God fulfilled his plan for the world's salvation through the life, death, and resurrection of Jesus of Nazareth, the promised Messiah. Acts continues the story of Christianity in the 1st century, beginning with Jesus's ascension to Heaven. The early chapters, set in Jerusalem, describe the Day of Pentecost (the coming of the Holy Spirit) and the growth of the church in Jerusalem. Initially, the Jews are receptive to the Christian message, but soon they turn against the followers of Jesus. Rejected by the Jews, under the guidance of the Apostle Peter the message is taken to the Gentiles. The later chapters tell of Paul's conversion, his mission in Asia Minor and the Aegean, and finally his imprisonment in Rome, where, as the book ends, he awaits trial. Luke–Acts is an attempt to answer a theological problem, namely how the Messiah of the Jews came to have an overwhelmingly non-Jewish church; the answer it provides, and its central theme, is that the message of Christ was sent to the Gentiles because the Jews rejected it. Luke–Acts can be also seen as a defense of (or "apology" for) the Jesus movement addressed to the Jews: the bulk of the speeches and sermons in Acts are addressed to Jewish audiences, with the Romans serving as external arbiters on disputes concerning Jewish customs and law. On the one hand, Luke portrays the Christians as a sect of the Jews, and therefore entitled to legal protection as a recognised religion; on the other, Luke seems unclear as to the future God intends for Jews and Christians, celebrating the Jewishness of Jesus and his immediate followers while also stressing how the Jews had rejected God's promised Messiah. The title "Acts of the Apostles" (Greek Πράξεις ἀποστόλων Praxeis Apostolon) was first used by Irenaeus in the late 2nd century. It is not known whether this was an existing title or one invented by Irenaeus; it does seem clear, however, that it was not given by the author. The Gospel of Luke and Acts make up a two-volume work which scholars call Luke–Acts. Together they account for 27.5% of the New Testament, the largest contribution attributed to a single author, providing the framework for both the Church's liturgical calendar and the historical outline into which later generations have fitted their idea of the story of Jesus and the early church. The author is not named in either volume. According to Church tradition dating from the 2nd century, he was the "Luke" named as a companion of the apostle Paul in three of the letters attributed to Paul himself; this view is still sometimes advanced, but "a critical consensus emphasizes the countless contradictions between the account in Acts and the authentic Pauline letters." (An example can be seen by comparing Acts's accounts of Paul's conversion (Acts 9:1–31, 22:6–21, and 26:9–23) with Paul's own statement that he remained unknown to Christians in Judea after that event (Galatians 1:17–24).) The author "is an admirer of Paul, but does not share Paul's own view of himself as an apostle; his own theology is considerably different from Paul's on key points and does not represent Paul's own views accurately." He was educated, a man of means, probably urban, and someone who respected manual work, although not a worker himself; this is significant, because more high-brow writers of the time looked down on the artisans and small business people who made up the early church of Paul and were presumably Luke's audience. While no proposed date for the composition of Acts is universally accepted, the most common scholarly position is to date Luke–Acts to 80-90 AD, on the grounds that it uses Mark as a source, looks back on the destruction of Jerusalem, and does not show any awareness of the letters of Paul (which began circulating late in the first century). The earliest possible date for the composition of Acts is set by the events with which it ends, Paul's imprisonment in Rome c. 63 AD, but such an early dating is a minority position. The last possible date would be set by its first definite citation by another author, but there is no unanimity on this; some scholars find echoes of Acts in a work from c. 95 AD called 1 Clement, while others see no indisputable citation until the middle of the 2nd century. A minority of scholars, necessarily in the latter camp, conclude that Acts dates to the 2nd century, believing that it shows awareness of the letters of Paul, the works of Josephus, or the writings of Marcion. There are two major textual variants of Acts, the Western text-type and the Alexandrian. 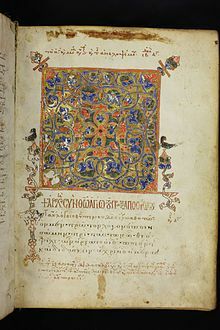 The oldest complete Alexandrian manuscripts date from the 4th century and the oldest Western ones from the 6th, with fragments and citations going back to the 3rd. Western texts of Acts are 6.2–8.4% longer than Alexandrian texts, the additions tending to enhance the Jewish rejection of the Messiah and the role of the Holy Spirit, in ways that are stylistically different from the rest of Acts. The majority of scholars prefer the Alexandrian (shorter) text-type over the Western as the more authentic, but this same argument would favour the Western over the Alexandrian for the Gospel of Luke, as in that case the Western version is the shorter; the debate therefore continues. The title "Acts of the Apostles" (Praxeis Apostolon) would seem to identify it with the genre telling of the deeds and achievements of great men (praxeis), but it was not the title given by the author. The anonymous author aligned Luke–Acts to the "narratives" (διήγησις, diēgēsis) which many others had written, and described his own work as an "orderly account" (ἀκριβῶς καθεξῆς). Thus while Acts is widely thought of as a history, it lacks exact analogies in Hellenistic or Jewish literature. The author of Acts may have taken as his model the works of Dionysius of Halicarnassus, who wrote a well-known history of Rome, or the Jewish historian Josephus, author of a history of the Jews. Like them, he anchors his history by dating the birth of the founder (Romulus for Dionysius, Moses for Josephus, Jesus for Luke) and like them he tells how the founder is born from God, taught authoritatively, and appeared to witnesses after death before ascending to heaven. By and large the sources for Acts can only be guessed at, but the author would have had access to the Septuagint (a Greek translation of the Jewish scriptures), the Gospel of Mark, and either the hypothetical collection of "sayings of Jesus" called the Q source or the Gospel of Matthew. He transposed a few incidents from Mark's gospel to the time of the Apostles—for example, the material about "clean" and "unclean" foods in Mark 7 is used in Acts 10, and Mark's account of the accusation that Jesus has attacked the Temple (Mark 14:58) is used in a story about Stephen (Acts 6:14). There are also points of contacts (meaning suggestive parallels but something less than clear evidence) with 1 Peter, the Letter to the Hebrews, and 1 Clement. Other sources can only be inferred from internal evidence—the traditional explanation of the three "we" passages, for example, is that they represent eyewitness accounts. The search for such inferred sources was popular in the 19th century, but by the mid-20th it had largely been abandoned. Acts was read as a reliable history of the early church well into the post-Reformation era. By the 17th century, however, biblical scholars began to notice that it was incomplete and tendentious—its picture of a harmonious church is quite at odds with that given by Paul's letters, and it omits important events such as the deaths of both Peter and Paul. The mid-19th-century scholar Ferdinand Baur suggested that the author of Acts had re-written history to present a united Peter and Paul and advance a single orthodoxy against the Marcionites. (Marcion was a 2nd-century heretic who wished to cut Christianity off entirely from the Jews). Baur continues to have enormous influence, but today there is less interest in determining the author of Acts' historical accuracy (although this has never died out) than in understanding his theological program. Luke was written to be read aloud to a group of Jesus-followers gathered in a house to share the Lord's supper. The author assumes an educated Greek-speaking audience, but directs his attention to specifically Christian concerns rather than to the Greco-Roman world at large. He begins his gospel with a preface addressed to Theophilus, informing him of his intention to provide an "ordered account" of events which will lead his reader to "certainty". He did not write in order to provide Theophilus with historical justification—"did it happen? "—but to encourage faith—"what happened, and what does it all mean?" Acts (or Luke–Acts) is intended as a work of "edification." Edification means "the empirical demonstration that virtue is superior to vice," but is not all of Luke's purpose. He also engages with the question of a Christian's proper relationship with the Roman Empire, the civil power of the day: could a Christian obey God and also Caesar? The answer is ambiguous. The Romans never move against Jesus or his followers unless provoked by the Jews, in the trial scenes the Christian missionaries are always cleared of charges of violating Roman laws, and Acts ends with Paul in Rome proclaiming the Christian message under Roman protection; at the same time, Luke makes clear that the Romans, like all earthly rulers, receive their authority from Satan, while Christ is ruler of the kingdom of God. Acts has two key structural principles. The first is the geographic movement from Jerusalem, centre of God's Covenantal people, the Jews, to Rome, centre of the Gentile world. This structure reaches back to the author's preceding work, the Gospel of Luke, and is signaled by parallel scenes such as Paul's utterance in Acts 19:21, which echoes Jesus's words in Luke 9:51: Paul has Rome as his destination, as Jesus had Jerusalem. The second key element is the roles of Peter and Paul, the first representing the Jewish Christian church, the second the mission to the Gentiles. The Gospel of Luke began with a prologue addressed to Theophilus; Acts likewise opens with an address to Theophilus and refers to "my earlier book", almost certainly the gospel. The apostles and other followers of Jesus meet and elect Matthias to replace Judas as a member of The Twelve. On Pentecost, the Holy Spirit descends and confers God's power on them, and Peter, along with John, preaches to many in Jerusalem, and performs Christ-like healings, casting out of evil spirits, and raising of the dead. The first believers share all property in common, ate in each other's homes, and worshipped together. At first many Jews follow Christ and are baptized, but the Christians begin to be increasingly persecuted by the Jews. Stephen is arrested for blasphemy, and after a trial, is found guilty and stoned by the Jews. Stephen's death marks a major turning point: the Jews have rejected the message, and henceforth it will be taken to the Gentiles. The message is taken to the Samaritans, a people rejected by Jews, and to the Gentiles. Saul of Tarsus, one of the Jews who persecuted the Christians, is converted by a vision to become a follower of Christ (an event which Luke regards as so important that he relates it three times). Peter, directed by a series of visions, preaches to Cornelius the Centurion, a Gentile God-fearer, who becomes a follower of Christ. The Holy Spirit descends on Peter and Cornelius, thus confirming that the message of eternal life in Christ is for all mankind. The Gentile church is established in Antioch (north-western Syria, the third-largest city of the empire), and here Christ's followers are first called Christians. The mission to the Gentiles is promoted from Antioch and confirmed at meeting in Jerusalem between Paul and the leadership of the Jerusalem church. Paul spends the next few years traveling through western Asia Minor and the Aegean, preaching, converting Gentiles, and founding new churches. On a visit to Jerusalem he is set on by a Jewish mob. Saved by the Roman commander, he is accused by the Jews of being a revolutionary, the "ringleader of the sect of the Nazarenes", and imprisoned. Paul asserts his right as a Roman citizen, to be tried in Rome and is sent by sea to Rome, where he spends another two years under house arrest, proclaiming the Kingdom of God and teaching the "Lord Jesus Christ". Acts ends abruptly without recording the outcome of Paul's legal troubles. Prior to the 1950s, Luke–Acts was seen as a historical work, written to defend Christianity before the Romans or Paul against his detractors; since then, however, the tendency has been to see the work as primarily theological. Luke's theology is expressed primarily through his overarching plot, the way scenes, themes and characters combine to construct his specific worldview. His "salvation history" stretches from the Creation to the present time of his readers, in three ages: first, the time of "the Law and the Prophets" (Luke 16:16), the period beginning with Genesis and ending with the appearance of John the Baptist (Luke 1:5–3:1); second, the epoch of Jesus, in which the Kingdom of God was preached (Luke 3:2–24:51); and finally the period of the Church, which began when the risen Christ was taken into Heaven, and would end with his second coming. Luke–Acts is an attempt to answer a theological problem, namely how the Messiah promised to the Jews came to have an overwhelmingly non-Jewish church; the answer it provides, and its central theme, is that the message of Christ was sent to the Gentiles because the Jews rejected it. This theme is introduced at the opening of the Gospel of Luke, when Jesus, rejected in Nazareth, recalls that the prophets were rejected by Israel and accepted by Gentiles; at the end of the gospel he commands his disciples to preach his message to all nations, "beginning from Jerusalem." He repeats the command in Acts, telling them to preach "in Jerusalem, in all Judea and Samaria, and to the end of the Earth." They then proceed to do so, in the order outlined: first Jerusalem, then Judea, then Samaria, then the entire (Roman) world. For Luke, the Holy Spirit is the driving force behind the spread of the Christian message, and he places more emphasis on it than do any of the other evangelists. The Spirit is "poured out" at Pentecost, on the first Samaritan and Gentile believers, and on disciples who had been baptised only by John the Baptist, each time as a sign of God's approval. The Holy Spirit represents God's power (At his ascension, Jesus tells his followers, "You shall receive power when the Holy Spirit has come upon you"): through it the disciples are given speech to convert thousands in Jerusalem, forming the first church (the term is used for the first time in Acts 5). One issue debated by scholars is Luke's political vision regarding the relationship between the early church and the Roman Empire. On the one hand, Luke generally does not portray this interaction as one of direct conflict. Rather, there are ways in which each may have considered having a relationship with the other rather advantageous to its own cause. For example, early Christians may have appreciated hearing about the protection Paul received from Roman officials against Gentile rioters in Philippi (Acts 16:16-40) and Ephesus (Acts 19:23-41), and against Jewish rioters on two occasions (Acts 17:1-17; Acts 18:12-17). 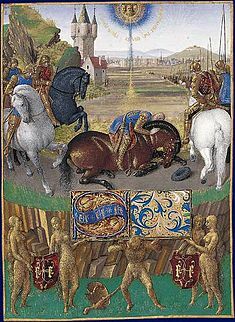 Meanwhile, Roman readers may have approved of Paul's censure of the illegal practice of magic (Acts 19:17-19) as well as the amicability of his rapport with Roman officials such as Sergius Paulus (Acts 13:6-12) and Festus (Acts 26:30-32). Furthermore, Acts does not include any account of a struggle between Christians and the Roman government as a result of the latter's imperial cult. Thus Paul is depicted as a moderating presence between the church and the Roman Empire. On the other hand, events such as the imprisonment of Paul at the hands of the empire (Acts 22-28) as well as several encounters that reflect negatively on Roman officials (for instance, Felix's desire for a bribe from Paul in Acts 24:26) function as concrete points of conflict between Rome and the early church. Perhaps the most significant point of tension between Roman imperial ideology and Luke's political vision is reflected in Peter's speech to the Roman centurion, Cornelius (Acts 10:36). Peter states that "this one" [οὗτος], i.e. Jesus, "is lord [κύριος] of all." The title, κύριος, was often ascribed to the Roman emperor in antiquity, rendering its use by Luke as an appellation for Jesus an unsubtle challenge to the emperor's authority. As the second part of the two-part work Luke–Acts, Acts has significant links to the Gospel of Luke. Major turning points in the structure of Acts, for example, find parallels in Luke: the presentation of the child Jesus in the Temple parallels the opening of Acts in the Temple, Jesus's forty days of testing in the wilderness prior to his mission parallel the forty days prior to his Ascension in Acts, the mission of Jesus in Samaria and the Decapolis (the lands of the Samaritans and Gentiles) parallels the missions of the Apostles in Samaria and the Gentile lands, and so on (see Gospel of Luke). These parallels continue through both books. There are also differences between Luke and Acts, amounting at times to outright contradiction. For example, the gospel seems to place the Ascension on Easter Sunday, immediately after the Resurrection, while Acts 1 puts it forty days later. There are similar conflicts over the theology. While not seriously questioning the single authorship of Luke–Acts, these differences do suggest the need for caution in seeking too much consistency in books written in essence as popular literature. 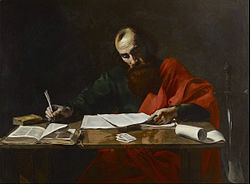 Acts agrees with Paul's letters on the major outline of Paul's career: he is converted and becomes a Christian missionary and apostle, establishing new churches in Asia Minor and the Aegean and struggling to free Gentile Christians from the Jewish Law. There are also agreements on many incidents, such as Paul's escape from Damascus, where he is lowered down the walls in a basket. But details of these same incidents are frequently contradictory: for example, according to Paul it was a pagan king who was trying to arrest him in Damascus, but according to Luke it was the Jews (2 Corinthians 11:33 and Acts 9:24). Acts speaks of "Christians" and "disciples", but Paul never uses either term, and it is striking that Acts never brings Paul into conflict with the Jerusalem church and places Paul under the authority of the Jerusalem church and its leaders, especially James and Peter (Acts 15 vs. Galatians 2). Acts omits much from the letters, notably Paul's problems with his congregations (internal difficulties are said to be the fault of the Jews instead), and his apparent final rejection by the church leaders in Jerusalem (Acts has Paul and Barnabas deliver an offering that is accepted, a trip that has no mention in the letters). There are also major differences between Acts and Paul on Christology (the understanding of Christ's nature), eschatology (understanding of the "last things"), and apostleship. ^ a b c Burkett 2002, p. 263. ^ Charlesworth 2008, p. no page numbers. ^ a b Burkett 2002, p. 195. ^ a b Pickett 2011, pp. 6–7. ^ Boring 2012, p. 563. ^ a b Matthews 2011, p. 12. ^ a b Theissen & Merz 1998, p. 32. ^ Perkins 1998, p. 253. ^ Boring 2012, p. 590. ^ a b Green 1997, p. 35. ^ a b c d Boring 2012, p. 587. ^ a b Keener 2012, p. 384. ^ Powell 2018, p. 210. ^ Powell 2018, p. 211. ^ a b Thompson 2010, p. 332. ^ Ben Witherington III, New Testament History: A Narrative Account (Grand Rapids: Baker, 2001), 174–78. ^ Aune 1988, p. 77. ^ a b c Balch 2003, p. 1104. ^ Bruce 1990, p. 40. ^ Boring 2012, p. 577. ^ Powell 2018, p. 113. ^ Witherington 1998, p. 8. ^ Boring 2012, p. 578. ^ Bruce 1990, pp. 40–41. ^ Boring 2012, p. 579. ^ Holladay 2011, p. no page numbers. ^ Green 1995, pp. 16–17. ^ Green 1997, p. 36. ^ Fitzmyer 1998, pp. 55–65. ^ Aune 1988, p. 80. ^ Boring 2012, p. 562. ^ Boring 2012, pp. 569–70. ^ "Bruderhof - Fellowship for Intentional Community". Fellowship for Intentional Community. Retrieved 2017-12-28. ^ Burkett 2002, p. 265. ^ Burkett 2002, p. 266. ^ Eerdmans Dictionary of the Bible. Freedman, David Noel, 1922-2008., Myers, Allen C., 1945-, Beck, Astrid B. Grand Rapids, Mich.: W.B. Eerdmans. 2000. ISBN 978-0802824004. OCLC 44454699. ^ Buckwalter 1996, p. 6. ^ Allen 2009, p. 326. ^ Evans 2011, p. no page numbers. ^ Burkett 2002, p. 264. ^ Burkett 2002, pp. 268–70. ^ Phillips 2009, pp. 119. ^ Phillips 2009, pp. 119-21. ^ Rowe 2005, pp. 291-8. ^ Zwiep 2010, p. 39. ^ Parsons 1993, pp. 17–18. ^ Phillips, Thomas E. (January 1, 2010). Paul, His Letters, and Acts. Grand Rapids, Mich.: Baker Academic. p. 196. ISBN 978-1-4412-5793-2. ^ Boring 2012, pp. 581, 588–90. Allen, O. Wesley, Jr. (2009). "Luke". In Petersen, David L.; O'Day, Gail R. Theological Bible Commentary. Westminster John Knox Press. ISBN 9781611640304. Aune, David E. (1988). The New Testament in its Literary Environment. Westminster John Knox Press. ISBN 9780227679104. Balch, David L. (2003). "Luke". In Dunn, James D. G.; Rogerson, John William. Eerdmans Commentary on the Bible. Eerdmans. ISBN 9780802837110. Boring, M. Eugene (2012). An Introduction to the New Testament: History, Literature, Theology. Westminster John Knox Press. ISBN 9780664255923. Bruce, F.F. (1990). The Acts of the Apostles: The Greek Text with Introduction and Commentary. Eerdmans. ISBN 978-0802809667. Buckwalter, Douglas (1996). The Character and Purpose of Luke's Christology. Cambridge University Press. ISBN 9780521561808. Evans, Craig A. (2011). Luke. Baker Books. ISBN 9781441236524. Fitzmyer, Joseph A. (1998). The Anchor Bible: The Acts of the Apostles-A new Translation with Introduction and Commentary. Doubleday. ISBN 978-0385490207. Gooding, David (2013). True to the Faith: The Acts of the Apostles: Defining and Defending the Gospel. Myrtlefield House. ISBN 9781874584315. Green, Joel (1995). The Theology of the Gospel of Luke. Cambridge University Press. ISBN 9780521469326. Keener, Craig S. (2012). Acts: An Exegetical Commentary. Volume I: Introduction And 1:1-2:47. Baker Academic. ISBN 9781441236210. Matthews, Christopher R. (2011). "Acts of the Apostles". In Coogan, Michael D. The Oxford Encyclopedia of the Books of the Bible. Oxford University Press. Parsons, Mikeal C. (1993). Rethinking the Unity of Luke and Acts. Fortress Press. ISBN 9781451417012. Phillips, Thomas E. (2009). Paul, His Letters, and Acts. Baker Academic. ISBN 978-1441241948. Pickett, Raymond (2011). "Luke and Empire: An Introduction". In Rhoads, David; Esterline, David; Lee, Jae Won. Luke-Acts and Empire: Essays in Honor of Robert L. Brawley. Wipf and Stock Publishers. Powell, Mark Allan (2018). Introducing the New Testament: A Historical, Literary and Theological Survey (2nd ed.). Baker Academic. ISBN 9781493413133. Rowe, C. Kavin (2005). "Luke-Acts and the Imperial Cult: A Way through the Conundrum?". Journal for the Study of the New Testament. 27 (3): 279–300. doi:10.1177/0142064X05052507. Theissen, Gerd; Merz, Annette (1998). The historical Jesus: a comprehensive guide. Eerdmans. Witherington, Ben (1998). The Acts of the Apostles: A Socio-rhetorical Commentary. Eerdmans. ISBN 9780802845016. Zwiep, Arie W. (2010). Christ, the Spirit and the Community of God: Essays on the Acts of the Apostles. Mohr Siebeck. ISBN 9783161506758. Wikimedia Commons has media related to Acts of the Apostles. Breen, Andrew Edward (1913). "Acts of the Apostles" . Catholic Encyclopedia. "Acts of the Apostles" . New International Encyclopedia. 1905. "Acts of the Apostles" . The American Cyclopædia. 1879.